Now that the National Curriculum is upon us, this useful set of FAQs will help to dispel any myths and misunderstandings that teachers may have about its content and implementation. 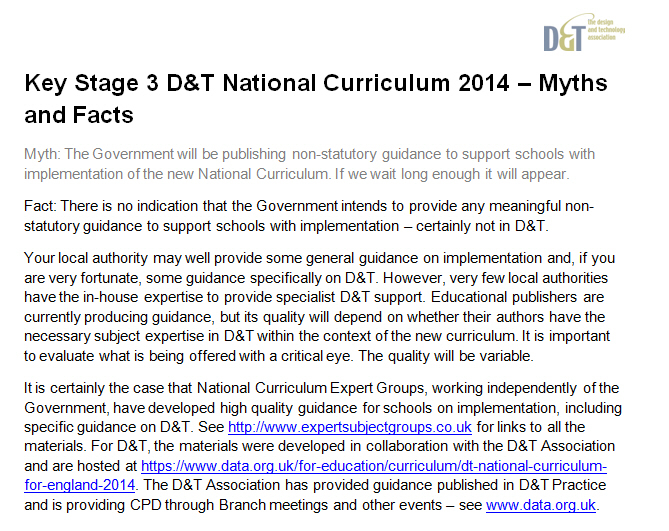 For example: Will there be non- statutory guidance from the Government? Is the NC still in draft form or finalised? Will the Government provide new level descriptions soon? What has changed, if anything, from the old programmes of study? Is Cooking and Nutrition to be taught separately from designing and making? If you need to brush up on what elements have changed, what remains in place and what has been left out but remains important, this is a good place to start.